10 oz assorted mushrooms, sliced. Place mushrooms in boiling water; let stand for 30 minutes. Squeeze mushrooms, reserving the liquid; transfer to a cutting board and coarsely chop. While mushrooms are soaking, make the custard by whisking together cream, egg and yolks in small bowl; season to taste with salt & pepper. Set aside. Melt butter in a large skillet over high heat. Add mushrooms; saute until brown, about 10 minutes. Add shallots; cook onother two minutes. Pour in brandy and reserved porcini liquid; cook until liquid is almost dry. Stir in herbs; transfer to bowl and set aside to cool. 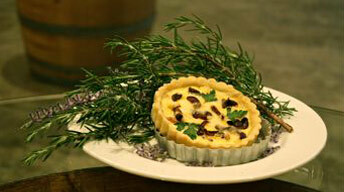 Blend Gruyere into the mushroom mixture and sprinkle into pre-baked tart shell. Pour custard into the shell, filling to the top. Bake until custard is set and golden brown, about 30 minutes. Let cool a few minutes. Serve warm or at room temperature. Blend flour, salt and butter in a food processor until mixture resembles coarse meal. Add egg; blend until dough forms a ball. Transfer dough to work surface and gather together and form into a disk. Wrap in plastic and chill for 30 minutes. Roll out dough on a floured surface to approximately 1/4-inch thickness. Line a 9-inch tart pan with a removable bottom. Trim edges leaving a ½ inch overhang. (There will be leftover dough.) Fold overhang in to form a double thick side. Press tart edges to raise dough 1/8 inch above pan. Chill for 30 minutes. Preheat oven to 375 degrees. Line pastry with foil and fill with dried beans. Bake until golden brown, about 15 minutes. Remove beans and foil; set aside.